Sintra is so close to Lisbon that you can see Pena Palace from Lisbon. I stayed in 1908 Lisboa hotel in Lisbon and visited Sintra on a day trip. Pena Palace is a UNESCO world heritage site. It was constructed in 1854 as a summer residence for the Portuguese royal family. The palace has 3 major colors, yellow, red and blue (azulejos). The best place to photograph the yellow facade of Pena Palace is from High Cross (Cruz Alta). High Cross is located in the gardens of Pena Palace. From High Cross you also get a good view of Lisbon and Belem Tower. The best place to photograph the red facade of Pena Palace is from the Castle of the Moors. You’ll need a camera with good zoom to photograph the palace from these locations. The best place to photograph the blue tiled facade is from the castle grounds. When you enter the Pena Palace gardens you have 2 choices of ticket. The first is only for the gardens but you can also walk around the palace. The second more expensive ticket includes access to the interior of the palace as well. The Castle of the Moors is a UNESCO world heritage site. Now medieval castle ruins, it was built by the Moors in the 8th century. It’s a short walk from the Pena Palace gardens. From the Castle of the Moors you can take a rare shot of the red facade of the palace. You will need good zoom. 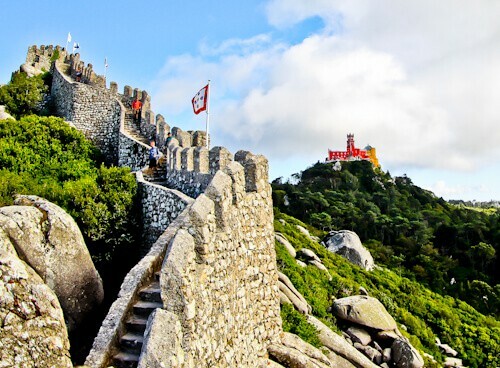 From the Castle of the Moors there is a marked path which takes you to downtown Sintra. You could walk up to the Castle but with the heat in Portugal you’ll become very sweaty. I’d recommend taking the local bus or tuk tuk to the top and walking down. You can haggle with the tuk tuk drivers. The best time to haggle with them is when they are not at their base. The cultural landscape of Sintra is a UNESCO world heritage site. This includes the whole town of Sintra. Sintra is a small town which can be very crowded. It’s best not to visit on weekends when it feels like everyone from Lisbon is there. In the town you’ll find restaurants, bars, hotels, cobbled streets and the main train station. The train station connects Sintra to Lisbon. Local buses leave from outside the train station. The local buses go to sites includings Pena Palace, Monserrate Palace and Cabo Da Roca. An easier way to see the sites would be the Sintra Hop on Hop off bus service. Sintra Palace is located in the center of Sintra. The history of the palace dates back to the 8th century. It has an architectural mix of Moorish, Gothic and Renaissance. In later years it was the residence of Portuguese royalty. Today the palace is a museum. The best place to photograph Sintra Palace is from the Castle of the Moors. You’ll need a camera with good zoom to take this shot. A good alternative location to take a shot would be from directly opposite on the Volta Duche. 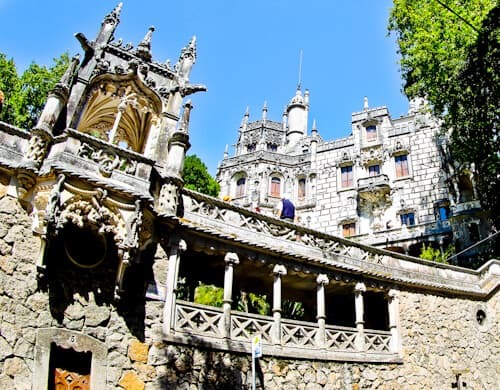 Quinta da Regaleira is a short walk from Sintra town. It is part of the UNESCO world heritage cultural landscape of Sintra. The palace was originally owned by Viscountess of Regaleira which is how it got its name. It wasn’t until 1892 when it was bought by Carvalho Monteiro that it started to look how it does today. At the start of the 20th century with the help of an Italian architect, extensive building was done on the grounds. The architectural styles you will see are Renaissance, Roman and Gothic. The most interesting area of the grounds are the initiation wells. There a 2 wells which look like underground towers as you look down. The wells are connected by underground tunnels. Those who are visiting to make unique Instagram shots will love the initiation wells. 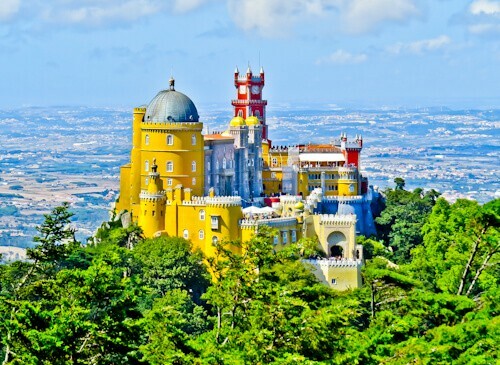 Monserrate Palace is part of the UNESCO world heritage cultural landscape of Sintra. It’s possible to walk to the Palace from Sintra town. The problem with walking is that you walk on a country road which is not really safe. I would recommend taking a bus or taxi to Monserrate Palace. The palace is the quietest of the sites of Sintra which makes it perfect for taking Instagram shots. It is grand, pink and of Gothic architectural style. Cabo da Roca is the westernmost point of continental Europe. There is a marker and cross on the cape. You’ll find a couple of restaurants and souvenir stores. The most notable building on the cape is the lighthouse. The lighthouse is known in Portuguese as the Farol do Cabo da Roca. Being the westernmost point of Europe makes Cabo da Roca the perfect starting point for a European trip. It is my starting point for a trip east to Tehran, only by land. The train leaves Lisbon Rossio station and arrives at Sintra train station. To get back to Lisbon you take any Lisbon train which leave every 30 minutes. A return ticket between Lisbon and Sintra will cost you less than €5. From outside Sintra train station there are regular buses to Cabo Da Roca. Awesome post! It’s very useful for us(going to Lisbon in January)! The castles here are incredible! The colours and the structures are so detailed and intricate. I could photograph them all day! And it’s nice that Sintra is only a short ride from Lisbon, it would make for a great day trip. Pena Palace is so colorful and in top form despite its age. Glad that you mentioned the best vantage points for the picture. I often waste time trying to find it at places. Castle of the moors is my kind of place. I love visiting ruins. My daughter keeps asking to see castles and we are considering Portugal! Love the vibrant colors, not the drab you normally see with castles. Your photos are beautiful! 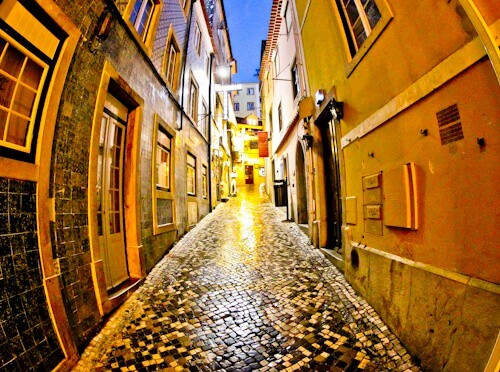 I love all the vibrant colors of Portugal! Next time I’m going to venture to a castle, I especially love the colorful one you visited, Pena Palace. It’s unlike any other castle I’ve seen! 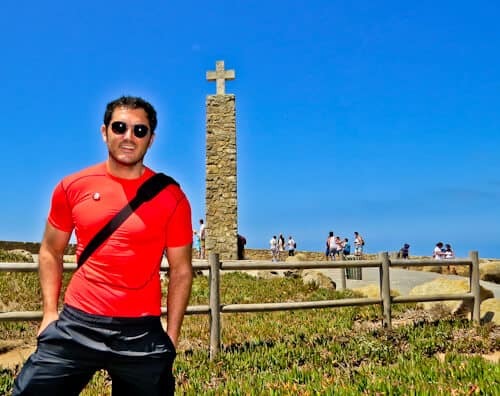 This post just brought back so many memories from my trip to Sinta and Cabo Da roca last year. Didn’t know about High Cross though. Would have loved to photograph the Pena palace from there. Love all the photographs in this post. So much to see in Portugal. I like the colorful palace of Pena. Its just too beautiful. I’m more stunned by Sintra Town. 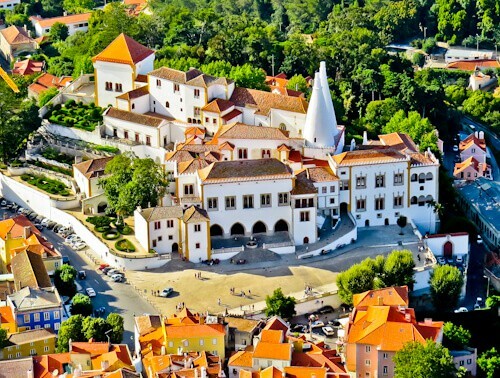 If there anywhere I’d love to do right now is to jet off to Sintra Town. The Castle of the Moors is a slo a good place to feed my architectural hunger. Portugal is one country I’d love to visit. Oh I am dying to go! You gave some great tips and I am loving that fish lens photo! That’s my next lens! So many palaces and that itself is a huge reason for me to go. I love the Pena Palace with its striking color. And your tips on the various vantage points and lens to capture it is really useful. Especially if you are short of time and are looking at that perfect shot. Well done with those. Thanks for sharing such an interesting place. Sintra is really a wonderland with so many colorful castles and palaces. That bright yellow Pena Palace is so magical and I can take as many pictures as I could. Sintra Palace is also equally beautiful. Also streets of Sintra town are so interesting for walking around. You hit all the places I want to visit in Sintra. People tend to focus on the Pena Palace and a bit on the town. But, I know there is much more to see. I even want to stay one night in the town in order to see everything I want. Great photos! Hey, not sure if you noticed there is a huge space between a line saying “Related Posts” and the comments sections. It looks like like you post does not have a comments sections. Letting you know so you do not miss some commenting opportunities. Sintra looks stunning! We were over in Lisbon in August and want to go back.. maybe a long weekend. This is a great travel resource and such an easy day trip to do 🙂 Sintra Palace looks stunning. It looks so vibrant! Looks like an amazing place to explore!! What cool colours! 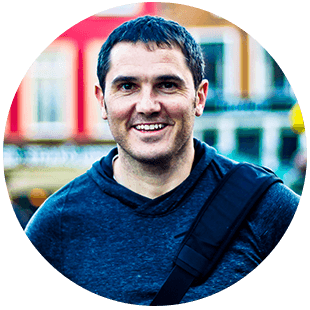 I have been following your trip overland to Kiev, and was confused about the quick move to Portugal, but I’ve just noticed that I’ve missed some blogs. You do get about! I wasn’t familiar with Sintra. It seems quiet and very picturesque. 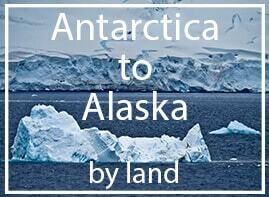 The photography tips will definitely help when I make it to that beautiful area! So many beautiful UNESCO World Heritage Site!!! 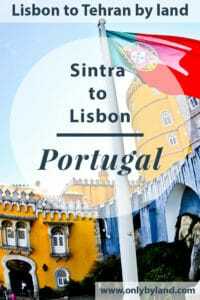 I have yet to visit Portugal but one day I will definitely get there and I can’t wait to see Sintra and the beautiful Pena Palace! Thank you for bringing back great memories of a wonderful place for me. SIntra is so colourful, and pretty romantic too with the sculptures lining the road. I totally agree about getting a ride to the top. I stupidly tried walking and gave up halfway! Quinta de Regaleira is stunning and I spent too long there!